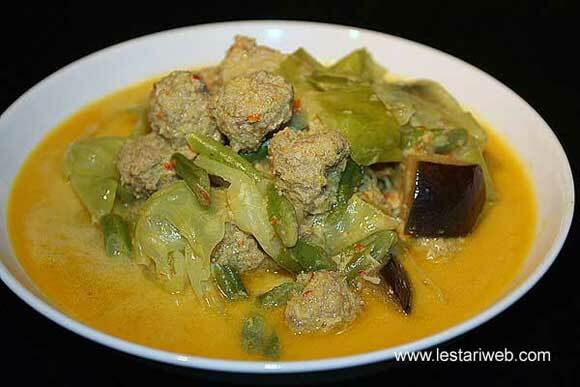 This is another variant of Meat Ball soup from Palembang city : Sengkuang. 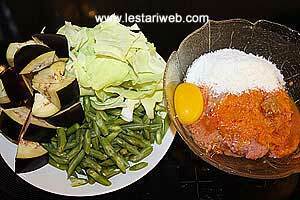 The is another famous South Sumatra culinary icons beside Mpek-Mpek & Pindang Tulang. What makes this meat ball different than the common Indonesian Meatball Soup or Bakso is the they add a little bit grated coconut in the dough as well as coconut milk into the soup. 2. 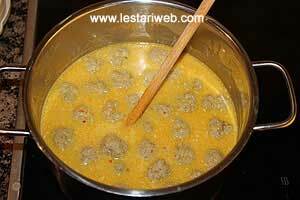 At the beginning of boiling process, prepare 1 pc at first, boil & wait until the meatball well cooked and floating on the water surface, then taste it. Adjust the seasoning, add salt or sugar if necessary & mix the whole dough once again. Try to boil once more, taste it and so on until the flavor suit to your taste, then you can form the rest of the meatballs and boil them all. It is important to follow this step because once you've get them boiled, but the meatballs taste bland, then you can not rework them back or reverse the process. In a short word, your meatballs will go to the trash bin for sure!! I'm telling you from my own experience :-(. So have a nice cooking & Good Luck ..
1Put all ingredients for the paste in a blender/food processor & blend into a smooth paste. 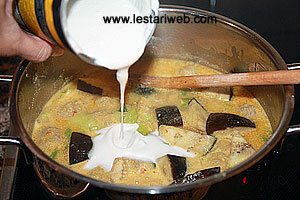 (If necessary add a little bit thin coconut milk into a blender to help the blending process). 2Divide the paste into 2 portions. Transfer one portion into a large bowl. Put them aside. 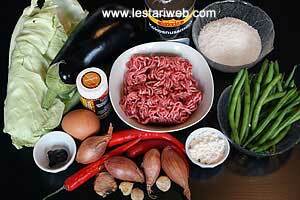 3Making Meat Ball: Put the minced beef into the food processor and blend until smooth. Transfer into a large bowl. 4Meanwhile put the other other portion of the paste in a deep saucepan, add the thin coconut milk & bring this to boil over medium heat. 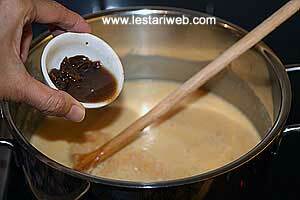 Add the tamarind juice. Stir occationally. 5Mix the beef, spice paste, shredded/desiccated coconut, egg & tapioca flour/corn starch, knead until you get a smooth dough. 6Form one of a meatball, let it boil & cook. Taste it and adjust the seasoning accodingly as I explain on the above tipps. 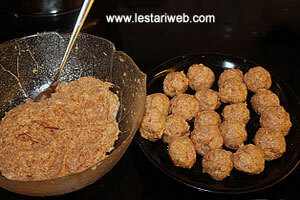 7Form all the meatballl into a round shape and add to the saucepan. 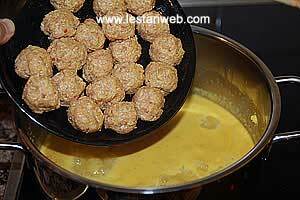 8Cook until the meatballs are done and floating to the water surface. 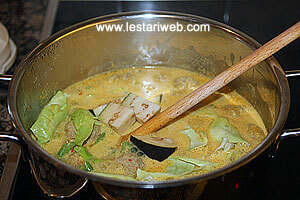 9Add the thick coconut milk, cook untuk the vegetables becomes tender. 10Adjust the seasoning, add salt & sugar to taste. Serve hot with rice.